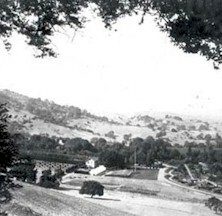 In the mid-1800s, vineyards were prevalent throughout rural Petaluma. The thriving Victorian riverfront city served as a watering hole, as well as a shipping channel to transport mining supplies, grains and other food products for the miners heading to the hills in search of gold. Situated on a waterway that provided year-round transportation to San Francisco, Petaluma was a natural location for producing and shipping wine, and wine traveled from warehouses in the downtown district of Petaluma, along the river, to San Francisco and beyond. Vineyards sprang up within the Petaluma Gap area, producing wine for both locals and the hordes of “’49ers” that were flocking to San Francisco and the Sierras. In 1989, historian William F. Heintz completed a fascinating document at the behest of the Sangiacomo family of Sangiacomo vineyard fame. The extensive study records the history of wines and viticulture in the Lakeville area from its earliest beginnings, and much of the information that follows is summarized from that document. There is an excitement in unearthing the names of the grape growers and wine makers of a bygone day. The early wine pioneers might not be as well known as those who founded the more famous vineyards further north or east, but the names of William Bihler, John G. Staedler and James G. Fair were big news during a big time for wine. 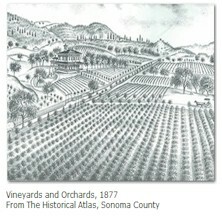 Staedler appears to have been the first to plant vines in or near Petaluma, in the early 1860s. William Bihler planted vines on the banks of Petaluma creek, on the adjacent hillsides, and in the Lakeville area about 1878. Many vines found their way here in the form of old-world rootstock, smuggled in by Italian, French, German, Swiss and other immigrant European settlers and initially intended for their own “house wine.” The mix of grape varieties mentioned in early accounts were Zinfandel and Alicante Bouschet. 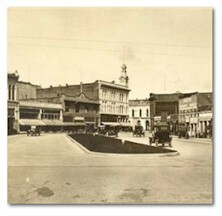 Petaluma’s first winery was founded in 1884 by G. V. Fischer. He took over an abandoned brewery to handle his first crush. There were also two wineries in the Lakeville area at that time. The largest was owned by James G. Fair — a U.S. Senator from Nevada, a famous silver baron, and the man who built the Fairmont Hotel in San Francisco. Fair’s winery was located in General Vallejo’s old brick armory on Lakeville Road, now part of Hendricks Ranch. By 1893, the winery had a 600,000 gallon capacity, making it one of the largest in the state. The other Lakeville area winery was on the Marcucci Ranch nearby. By the late 1870s the French wine industry was facing near extinction. An infestation of a root-born aphid called “phylloxera” was killing the vines. There was talk that California might replace France as the major producer of wine. With vineyard land available for $15 to $25 per acre, and the likelihood of making lots of money from growing grapes and producing wine, more and more vines were being planted. In just a decade, vineyard acreage more than quadrupled and the number of wineries did the same. The “Wine Rush” was on! In the early 1900s, in the Petaluma area alone, there were at least 1,000 acres of grapevines. Then came the dark ages of Prohibition and our own battle with phylloxera here in the North Bay. The aphid, it seems, had now developed a taste for California vines, especially when they were planted on the wrong rootstock. By the time Prohibition ended, what had been a rapidly growing industry was reduced to near wreckage. James Fair had purchased the Bihler vineyards in 1891, but he died in 1894. His sons sold what remained. Only one vineyard planted before the turn of the century, owned by the Marcuccis, survived until 1965. But that was the past, and slowly the vines have crept back, often taking the place of cattle, sheep and chickens in our area’s agricultural economy. Most plantings that have propelled the Petaluma Gap wines to their current levels of fame have taken place since the early 1990s.